Reprinted with permission from It’s Easy to Start Eating Vegan by Rebecca Gilbert. Now available for Kindle too! This easy vegan soup recipe is soy free, gluten-free and packed with 4 cups of super healthy broccoli! I’ve been trying to cook with less onions and garlic. I discovered that using shiitake mushrooms can add a “garlicky” taste without the garlic! This vegan recipe is quick, easy, and absolutely super yummy. I think I have a new favorite! Note: don’t use the coconut milk in can for Thai dishes. Make sure to use the coconut milk you drink (see photo). Canned coconut milk will give you a totally different taste and texture. Chef’s tip: If you don’t have veggie broth on hand, use water and bouillon cubes according to the instructions on the package to make 2 cups of broth. 1. Soak 1/2 cup of dried shiitake mushrooms in 1 cup of hot water. Let soak for at least 15 minutes. Set aside. 2. Chop 4 cups of broccoli plus 1 cup of broccoli florets for garnish. Steam the broccoli for 5-10 minutes, or until tender. 3. While waiting for the broccoli to cook, simmer two cups of vegetable broth in a large pot. Add the shiitake mushrooms and the soak liquid. Cube two small potatoes and add to the pot with 1 teaspoon of salt and 1 teaspoon of pepper. Cook for about 10 minutes, or until tender. 4. Once the potatoes are cooked, place the broth, shiitakes, and potatoes into your blender or Vita-Mix. Puree until completely liquified. This creates the smoky flavored base for your "cream" sauce! After pureeing, return contents to pot. 5. Add two cups of unsweetened coconut milk to blender or Vita-Mix. Add half of the steamed broccoli (reserving 1 cup of florets as garnish). Puree broccoli and add to pot. 6. Place the remaining broccoli in the blender or Vita-Mix with enough soup liquid to cover. For the Vita-Mix, pulse on 3 for 7- 8 pulses until the veggies are chopped into small pieces (not not pureed). If using a blender, blend for about 4 seconds on chop, or to your desired texture. 7. Transfer broccoli mixture to the pot and stir well. Simmer for about 5 minutes. Garnish with broccoli florets. 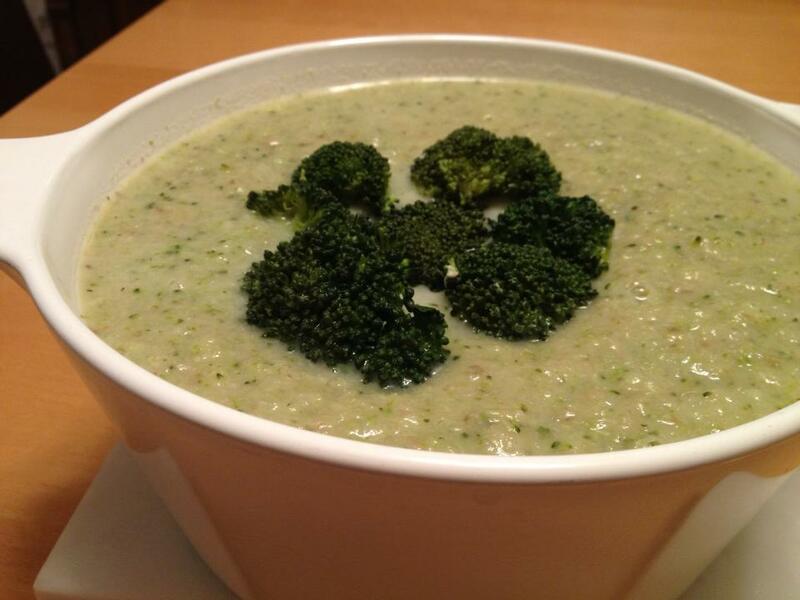 Let us know what you think of this easy vegan recipe: “Cream” of Broccoli Soup!